Tweens are at that lovely/awkward stage in childhood. They aren’t little enough to want to play in the sprinklers or kiddie pool. They also aren’t old enough to drive to the beach or have friends that are old enough to bring them. 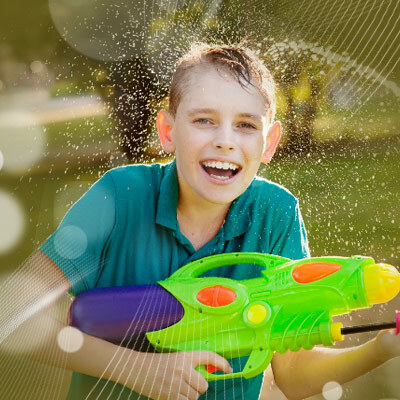 So, how’s a tween to have some water fun? Having experienced these years with my kids, I have a handful of ideas. Second, set up a parent schedule for beach days. Does your tween have a steady group of friends? Suggest to the parents that you take turns taking them to the beach. The frequency can be whatever you choose, but biweekly seems good to me. Set the number of kids as no more than the number of seatbelts available. Each parent will set aside one day to take the kids to the beach. With this system, working parents need to take off only one day, but the kids get multiple, chaperoned trips to the beach. Third, find a friend with a pool and offer to help. No, you can’t host at your house if you don’t have a pool, but you can make sure that the other parent has help. There are a number of things you can offer. Send snacks with your child for the whole group. Purchase and provide pool toys. If you’re friends with the parent, offer to spend time there with them or in place of them to keep an eye on the kids. Fourth, utilize your city pool. Many city pools allow kids age 10 and over without adult supervision. If you live near your pool, your tween can walk or bike there alone or with a friend for an afternoon of fun. Be sure that he understands the pool rules, as well as your own. A city pool is a great way to have some fun for free. With a little bit of planning and creativity, summer can be filled with safe and parent-friendly water fun!